I spent Saturday at the Cateran 55 ultra as one of my friends was taking part and I offered to give him a lift to and from the race. My plan, which worked out almost perfectly, was to drop him and a couple of his friends who were also running the race off in time for the start at 7am. 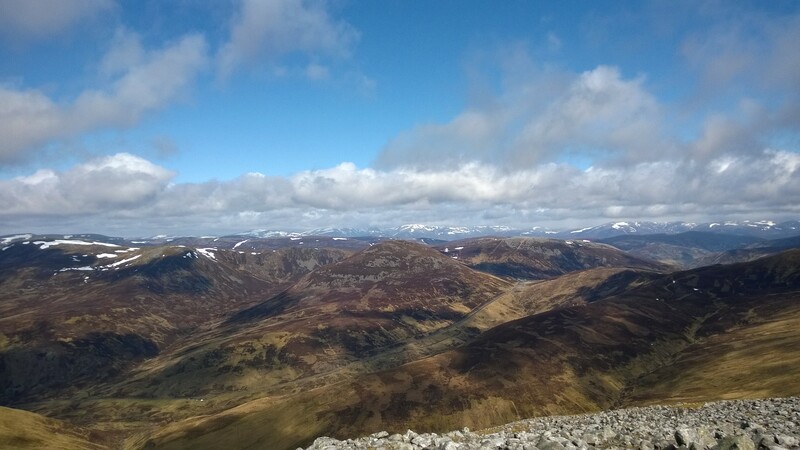 After seeing them off I went to have a run up and over a route which took in 3 Munros on the east side of Glenshee. We arrived a little early so had plenty of time to get some breakfast and a cup of tea before the race. My only ultra has been the Highland Fling which is a huge event. In comparison the Cateran 55 is a smaller but no lesser race. Alongside the Cateran 55 is the Cateran 110 or double as people call it. 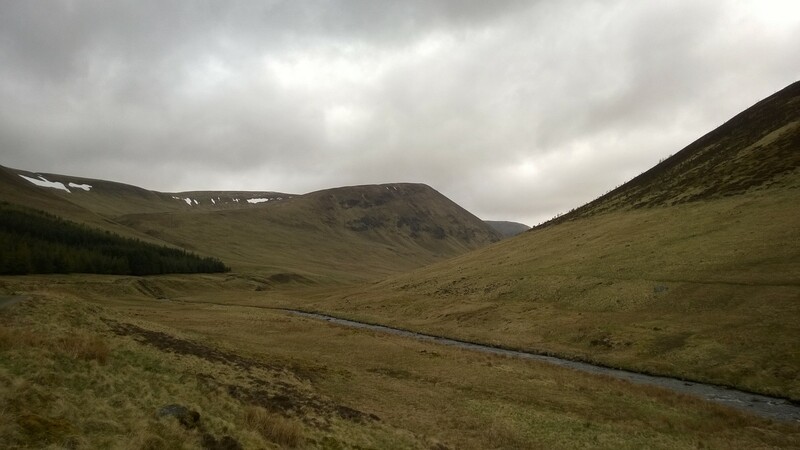 The race takes place around the Cateran trail which forms a loop around some rugged territory in the south of the Cairngorms. It really highlighted to me how friendly and supportive the whole ultra running community is. There looked to be less than 100 people running the 55 and I heard that the double, which set off at 4pm on Friday and performs two loops of the trail, had 15 people taking part. The race got underway with clear skies and a light breeze, perfect running conditions. I got myself into the car and headed across to Glenisla for the start of my run. I parked near Auchavan and followed the Walk Highlands route towards my first hill, Monega. The trail from the car meandered along the glen floor before taking a turn left to make the long slog up the ridge line of Monega hill. The climb up Monega was slow but steady. I tried to take a slow run all the way up but was forced to walk a few sections which were just too tough for my legs. Regardless, I managed to the King of the hill in strava; result! By the time I reached the summit, the weather awarded me fantastic views into the rocky end of Glen Isla. From the summit, the path followed a line along some cliffs towards Glas Maol, the first of two Munro’s on the route. I was happy to take a reasonable run along this and was taking the opportunity to snap some pics. As I reached the end of the cliffs and before the short climb up to Glas Maol, I was still taking photos and hadn’t noticed the weather closing in from the west. Before I knew it, the blue skies and sunshine were replaced with clouds and snow showers. A very clear reminder of how quickly things can change at this height. I checked my route map and read that Glas Maol had a shelter on it, so decided to up the pace and head for that. At this point, the wind had picked up and the snow was really coming down thick. I had my waterproofs on by now, hat and gloves, and was running to keep warm. It wasn’t working though. Within 5 minutes my extremeties were numb and I could feel myself stating to worry about where this was heading. 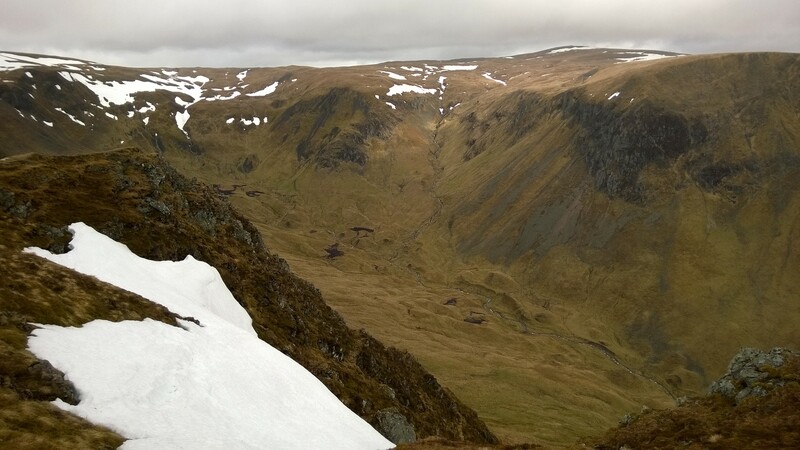 By now, I was still running along a track but realised I was traversing Glas Maol rather than going to its summit. I tried to get a bearing but with limitd visibility it was impossible. I decided the slope to my left must be the hill I wanted and thankfully sumitted it quickly and found the sheep fold on the top. I hid in this away from the worst of the weather, had a cereal bar and some fluids and studied the map. My compass was telling me I had to go in a direction which just felt wrong. I took bearings several times and eventually decided to trust my map and compass and not my instinct, which by this point was also numb! After some worrying meander down the slope to the west of Glas Maol, I found a stone wall that was to lead me over a bealach to Cleag Leacach, my 2nd munro of the day. As I made my way along the line of the wall, the cloud and snow storm cleared as quickly as it came and the views I was presented with were just breathtaking. I thanked myself for being sensible and following my compass and decided to just focus on enjoying the rest of the run. The last third of the run took in a couple of smaller hills before finally taking on Monamenach. After all the excitement of the snow storm and with tired legs, the direct climb up this final hill was….a little bit tough. Once over the top though, it was a long, steady decent back down to the foot of the glen and the flask of tea waiting in the car. By the time I was done, it wasn’t even lunchtime and I felt amazing. Distance: 22.6km, Time: 2h 29m, Avg. Pace: 7:56/KM, Total Elevation: 1365m. A perfect Saturday. Link to Strava for the running geeks. 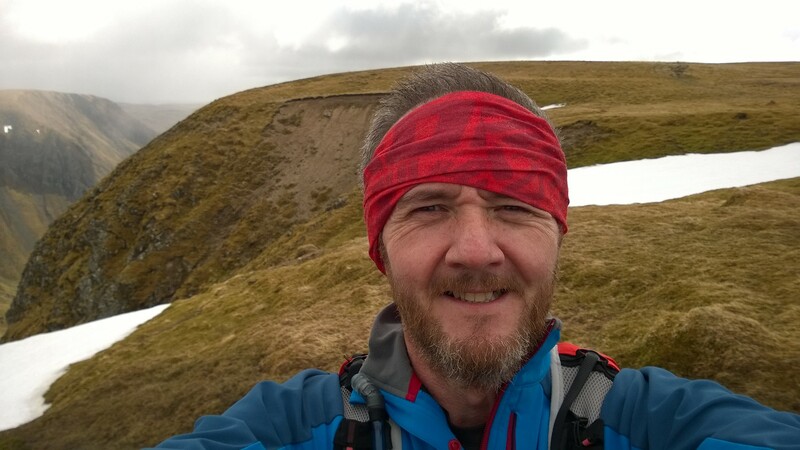 I returned to Spittal of Glenshee to discover my friend had pulled out of the ultra with some ITB pain. We still had to wait to the finish as one of the passengers in the car was still running, so we headed to the Glenshee ski center for a bite to eat and then came back to see the race leaders finishing. Both the 55 and 110 finish in the same direction around the trail, so the runners were mixed as they came home. We headed up the hill which the races comes down in its final stage to cheer on our friend. As we walked up, the leader of the 55 came past looking strong and eventually finished in about 8h and 15m. Then over the hill came the 110 leader. Now, I’ve seen lots of people finishing races since I started running and usually I find it really inspiring. Not on this occasion though. The guy we saw coming down that hill looked nothing short of delirious. He was running with pain in his eyes and a gait which suggested problems in later life were assured. I think it made me feel that races of that sort of distance are just never going to be my thing. The rest of the runners though just made me want to pull my shoes back on and get out there. I think the Cateran might feature on my race calendar next year. Being a spectator in the race also made me appreciate just how much work really goes into these things. I loved being part of the race without actually being in it and I will definitely be signing up to help with races in the future in some way. In other news, I finally made the decision and signed up to the Great Glen Ultra in July. I feel I owe it something as it is the race which inspired me to consider running an ultra, so hopefully I do it justice and have a good run. With another ultra now on the horizon, I was inspired to get out and put some more miles on the clock this morning. 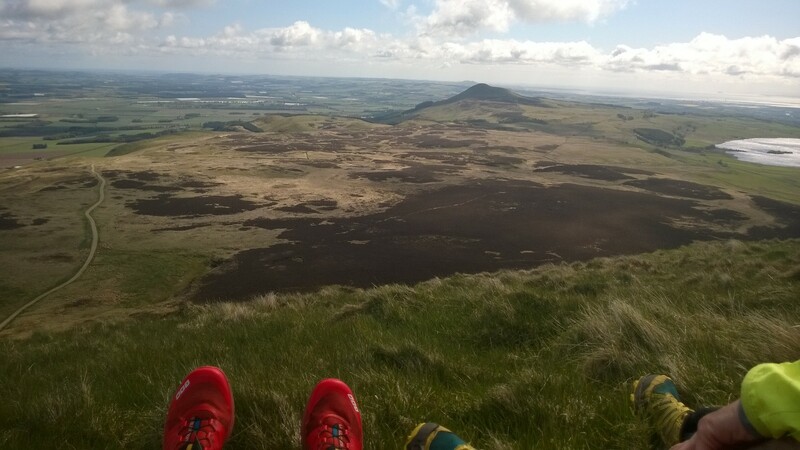 I headed out with the Falkland Trail runners for a jaunt up West Lomond. It wasn’t quite the views from yesterday, but it was good enough. I’m enjoying my running at the moment; long may it continue!